A few weeks back we asked The Ridge Church (in Columbus GA) to help us come up with some ideas for ways to Do Good in our community. We were thinking (and hoping) we would get 10-15 “projects” that we could all rally around in the coming weeks. What didn’t expect was SEVENTY FIVE (actually more are coming in every day)! So…..now we hope these serve as an inspiration to you. If you’d like to be a part of The Good Works Project……Just pick one (or several) and Do Something Good this week. If you have an idea you’d like us to add to the list, hit us up on Facebook, send an email, or go HERE and let us know what you’re thinking. We would LOVE to hear your ideas! Buy the meal for the person behind you in line at the drive thru. Small groups/journey groups to visit nursing homes once a month. Mail cards to people randomly – thinking of you, get well, sympathy, in times of trouble, congratulations. Leave a bigger tip at a local food joint. Encourage a teen to do something good. Sign up to run or walk a race for charity. Buy a coffee for a co-worker. Smile at everyone you talk to. Tell a family member you love them every day for a week. Show the mail or UPS delivery person appreciation. Do yard work for someone who is sick. Provide a meal for new moms. Baby sit for a family. Compliment a stranger every day. Take breakfast to one or more of the local fire stations. Offer to grocery shop for a neighbor who has small children or who has a lot going on. Offer to drive a friend’s children to school and activities for a day or a week to give them a break. Pay off lunch charges for a child at a local school. Take ice cream to people in nursing homes who may not have family close by. Deliver food and water to the homeless on the riverwalk. Choose a local charity to assist in helping them grown in their mission. Treat homeless people like people – have a genuine conversation with them. Gather up old sports equipment we have and donate to young people in need. Tape quarters to drink and snack machines around town or at washers/dryers at a laundromat. Thank a teacher – your teacher or your child’s teacher. Buy school supplies for teachers. Bring cookies, snacks, food to nursing staff at hospitals. Offer rides to chemo/dialysis patients. Offer rides to Mercy Med patients. Start fund for grocery cards for the elderly. Cook meals for the elderly. Make “goodwill” bags for the homeless community. Bags can include toiletries, socks, and a handwritten prayer. Make dinner for another family. Hand out water at the park to walkers/runners. Help at Feeding the Valley Food Bank with creating backpacks of food for children so they will have food for the weekends. Buy groceries for a needy family for a week. When traveling, leave a small treat (Michael’s, Dollar Tree has lots of things to choose from) in the hotel room to say thanks to the one who cleans up behind you. Plan/pay for a birthday party for a child whose family couldn’t afford to do so. Organize a flag football game for underprivileged youth. Send cards to a nursing home during the entire year. Help a sick child in need of special medical equipment. Adopt a family in need. 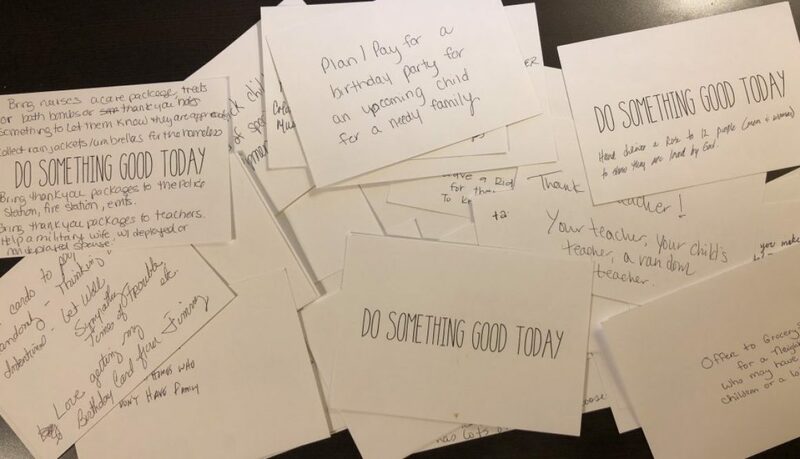 Bring thank you packages to teachers. Take young children to visit nursing homes to play games. Go to an animal shelter and love some animals. Send books and magazines to cancer center for people getting their chemo. 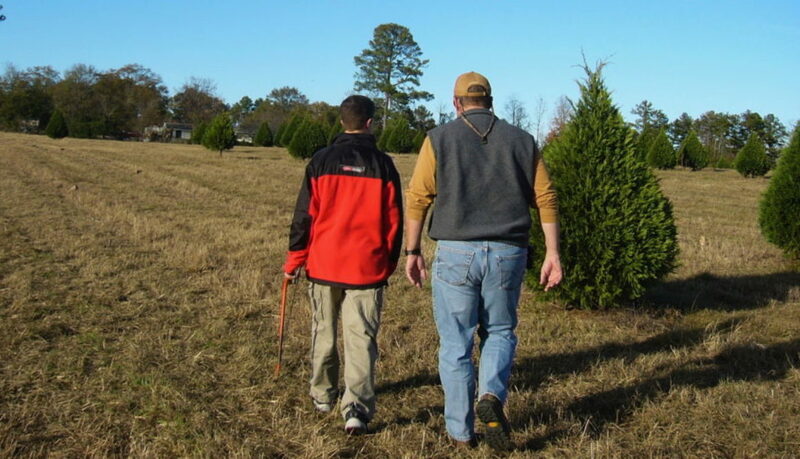 Partner with a family with an autistic child to help with their needs. Bring a meal to a struggling family. Find a person who is lonely, alone, widowed, single and take a walk with them. Volunteer at a ball field – field maintenance or concessions. Bring thank you packages to police stations. Help a military spouse (whether their spouse is deployed or not). Participate in a House of Heroes workday. Visit people who are sick. Take your neighbors trash can to their house on trash day. Volunteer with the special needs population. Donate hygiene kits for the homeless. Take Chick-fil-A to a person waiting at the bus stop. Deliver a rose to 12 people (male and females) to show they are loved. Deliver treats to local EMT’s. Make it a habit to always let someone merge in traffic. Write a note to a young person letting them know how proud you are of the way they are living their life. Write notes of encouragement to potential job applicants – who are living in local shelters or enrolled in job training programs. Work with local HS to provide nice graduation clothes to needy or “at risk” kids. Actually it was $18.98, and it forever changed my perspective on doing good. 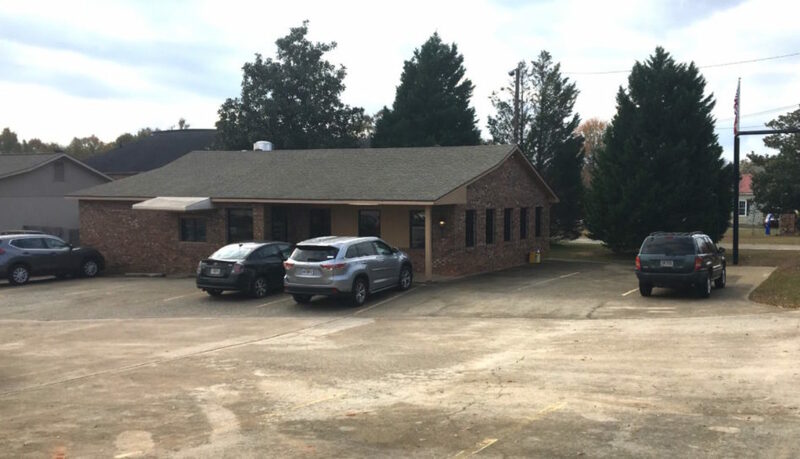 It all happened in a little restaurant in Waverly Hall, a small town in Southwest Georgia. This place is like many small town restaurants, with all you can eat meat and vegetables, served buffet style. The food is good, and the people are friendly. I like places like this. Like a lot of people, I will often pay for lunch for service members, law enforcement, fire fighters, or anyone else who looks like they could use a little anonymous gift. Whenever I do it, I always sneak out quietly. I don’t know why, but I want to be gone when they find out someone bought their lunch. I’m not looking for a thank you. I just do it. It doesn’t make me special. It just makes me happy. On this day, I saw a sweet elderly couple eating quietly across the room. They could have been in their 70s, but you could tell by the way they looked at each other that they were in love, just like the day they were married. He had some health problems that required her to help him more than he liked, but she was gentle and loving…patient and kind. He tolerated her help, and he obviously loved her for it. I remember thinking…for better or worse, richer or poorer, in sickness and in health, till death do us part. I loved just watching them interact. They reminded me of my grandparents, who I remember holding hands as they would sit and watch TV. When they finished eating, she helped him outside to sit in the sun while she paid the bill. I liked them, so I decided to buy them lunch. My plan was pretty simple. Pay my bill. Pay their bill. Leave without getting caught. So, here’s the part that changed everything for me. I don’t know what I expected to happen next, but she said, “That’s the nicest thing anyone has ever done for me.” And then, she started crying. Could paying for lunch really be the nicest thing anyone has ever done for her? This didn’t make sense. She wasn’t your typical person in need. I don’t think she needed the money. She wasn’t homeless. She was well dressed. She wasn’t going hungry. She had a nice car. And yet, this simple gesture brought her to tears. This beautiful woman, with a servant’s heart, just needed to feel appreciated, needed kindness, and needed someone to do something for her. And, I…almost missed it. I think most people have a heart for doing good. I wonder…as we all look for ways to serve, ways to be generous, or ways to make a difference, how many opportunities like this are hiding in plain sight? How many times do we walk right past people with needs…real needs…that go unattended? Needs that go unnoticed. How do we recognize needs that don’t fit the routine profile? I still believe we have a duty to serve the homeless, the hungry, the poor, the weak, the underprivileged. But I also believe we have an obligation to look past the obvious to find the needs that hide in plain sight. In the coming week, offer a gift of kindness or generosity to someone who doesn’t “look” like they need it. Who knows…you might make someone’s day. If you’re lucky, you might get to cry in a restaurant, with a total stranger. Have you ever felt prompted to do something for someone, but didn’t? You know, you see a hurried Mom in a grocery store drop her bag, but you were late so you kept going like you didn’t see it? Or, as you are pulling out of a parking lot as a sudden rain shower popped up, and you see a guy in a suit running to his car? Knowing you have an umbrella in the back seat, but you don’t hand it to him? Remember how it felt as you were leaving? Well, we got tired of feeling that way. We realized we had done that too many times. We realized we will never get that particular chance again. So, we want to be on guard for those moments. To be intentionally looking for them, and act on them the next time. Do you remember the feeling you got when you did stop and pick the groceries up? Or even just turned back and opened the door for the older lady that was coming, even though she was moving so slow. Remember her smile when she said “Thank you”? Well, that’s the feeling we like. It made us realize even the smallest act can bring happiness to someone. We walk away knowing we made that person’s day a just a little bit brighter. And that made our day brighter. We also realized, that, like anything, if we have other people encouraging us, we are more likely to keep going. It’s like running by yourself verses in a race. When you run alone, you just want to get finished. But when you are in a race with other people, and you come around the corner to see your friends snd family gathered along the course cheering for you, holding up signs, and yelling “you can do it!” something magical happens. You find strength you didn’t know you had. You finish better than you ever imagined you could. That’s what we are trying to do. We want to be the friends on the side of the track telling you “you can do it!” We want to help you “do good works.” We want to help each other. We started this to help encourage ourselves, and now, like anything good, we want to share it. We want Good Works Project to be a gathering place for ideas and an encouraging place to share success stories. You should check it out. Who knows, if enough of us do something good, we might change the world. So…this is a bit of a personal confession. This whole Good Works Project has been on my mind for years. The truth is that I think I’m a good guy. I’d like to think that others would tell you the same thing…that I’m the kind of guy who would give you the shirt off my back. However, if I’m honest….I don’t know that I’ve ever spent a day without my shirt on. The reality is that while I have that heart for doing good & helping others, I seldom actually do it. I think about it, talk about it, get emotional about it, get motivated, and two weeks later….nothing. My wife and I have both said, “If God would just let us win the lottery, we would give it all away and do some good in the world.” It’s silly isn’t it? It’s like we are waiting to become wealthy so we can be philanthropic or something. AND, it’s like somehow money is a substitute for action. Since we don’t seem to have a lot of extra cash laying around, we have a convenient excuse for sitting idly by while people who need our help (help that we could easily provide) go without. The more I talked to others, the more I found that I am not alone. It’s sad, really. Most of us are daydreaming about the generous life we aspire to live, without actually doing anything to make it happen. Especially for me, since I believe my Christian faith calls me to do good works and serve my fellow man. Often on Sunday mornings, I will hear a minister reminding me that my life is a gift that I should honor by serving others….and still I wait. About a year ago, I had the opportunity to hear Jonathan Falwell speak, and one comment he made stuck with me to this day. “Is your walk worthy of your calling?” Yikes! Um……well……no…..I mean not now it isn’t, but soon I’m going to get it together and be that guy I’m supposed to be. Did I mention that was over a year ago? Well this year, for Lent, I gave up procrastinating and making excuses about my unworthy walk. I’ll be perfectly honest with you…I created The Good Works Project for me. It is my way of getting myself awakened and active in a way I’ve never been before. I want to do something good. I want to do something. I want to DO. Starting today……and every day hereafter….I’m going to do some good for someone who needs it. Having said that…The Good Works Project no longer belongs to me. It’s OURS now. My sincere hope is that you find the Good Works Project to be a way to get yourself going, too. I hope you will take my cause and make it your cause. I hope you get as excited as I am. I hope you connect with us and contribute to the mission. We have big plans. As more and more people get involved, our collective capability to do good expands. I want to tap into that potential, and get hundreds, thousands, or even millions of people involved. I want to think BIG and go FAST, and spark the creative genius of the crowd to sustain our efforts and attract others who share our vision to do good things for a world that desperately needs it. We have all heard it. Give a man a fish…you feed him for a day. Teach a man to fish….you feed him for a lifetime. But what if that man is starving? What if he just needs a fish sandwich? In one of only two miracles recorded in all four gospels, Jesus was faced with a large crowd of hungry people. He didn’t hand them a fish, and He didn’t offer fishing lessons. He told them to get comfortable, took a few fish and some bread, and HE FED THEM. Simple. See a need – meet a need. And where did the fish and bread come from? A small boy who had no idea how his small gift would be used. He just offered what he had. It was a good thing. 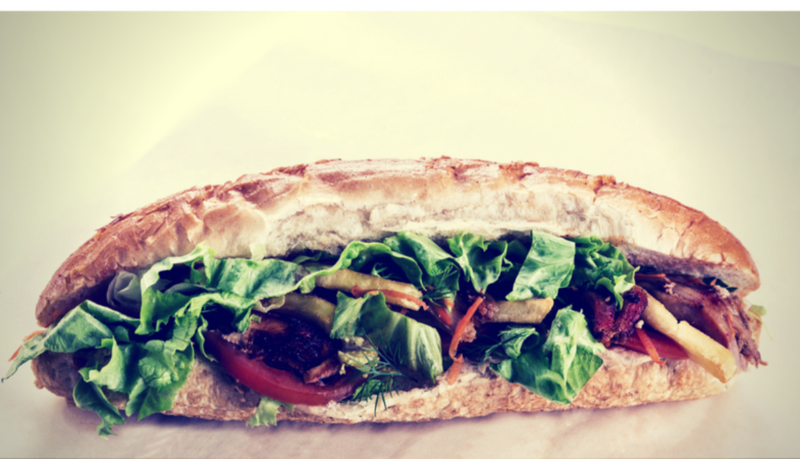 It turns out that a few fish and a little bread can go a long way when the right person makes the sandwiches. There is a lesson here for all of us. OK….so that may sound a little ambitious, but no great movement or cause ever started without great ambition. Fact is….we don’t plan to do this by ourselves. This is bigger than us. This requires all of us (that means you too). 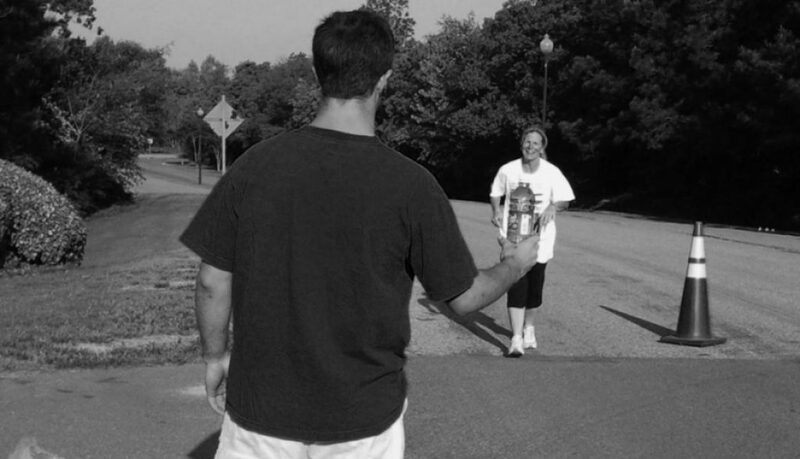 You see…The Good Works Project is a bit of a social experiment. Our goal is to encourage people of faith to collaborate together and take action to do good things for a world that desperately needs it. We are creating a social community to share and amplify the actions, causes, successes, prayers, and generosity of those doing good things, with the goal of inspiring, motivating, and encouraging more people to live a life of active service to others. Think of it as a way to encourage a small act of service and then replicate it through an engaged and active social media community. We’re not going to preach…..we’re going to DO. We’re also going to have fun, be a little edgy, and challenge conventional thinking along the way. Now, we are just getting started, but we have big (actually HUGE) plans for 2017 and beyond. In the coming months, we will start building the largest community for social good that social media has ever seen – just ordinary people (like you) doing extraordinary things. We want to change the world…for good.